Noah Gragson captured the pole for Friday’s JEGS 200 at Dover (Del.) International Speedway and was battling for the win before a late-race accident relegated the Safelite AutoGlass® Racing team to a 20th-place finish. 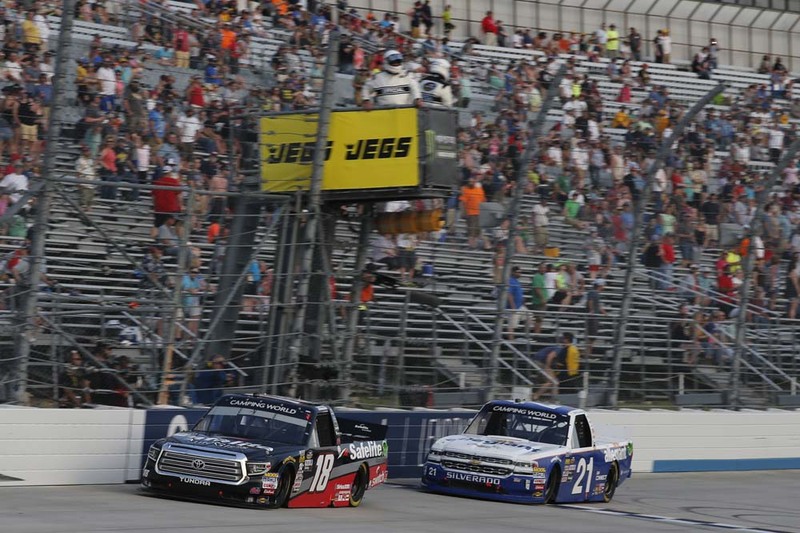 Gragson, who led three times for a total of 60 laps, used a strong restart to wrestle the lead from eventual winner Johnny Sauter with 12 laps remaining, but as the two were racing hard side-by-side for the top spot coming to the white flag the two trucks made contact at the entrance of Turn 3 causing Gragson’s Tundra to spin and slam backwards into the outside wall. Gragson captured his first pole of the season in Friday afternoon’s qualifying session and after the field took the green flag in the JEGS 200 went on to lead all 45 laps of Stage One. The Stage win was the Las Vegas native’s third of the season. 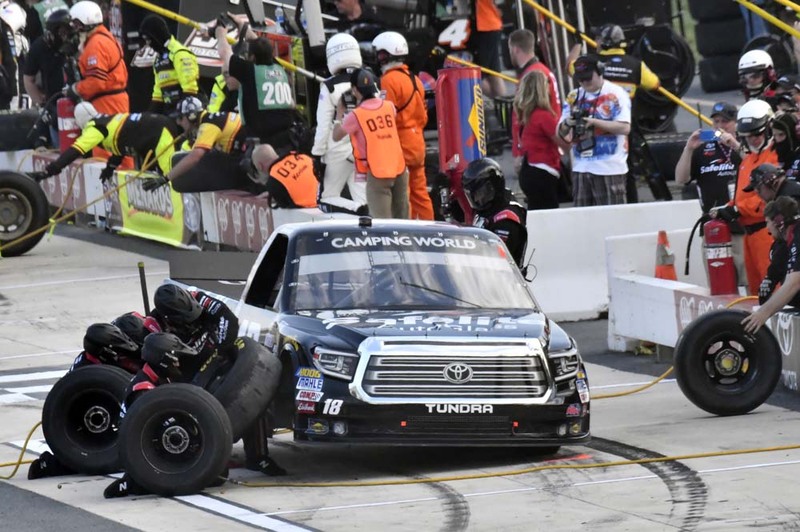 After communicating to crew chief Rudy Fugle that his Safelite Tundra was “a touch free on entry and tight on exit,” Gragson brought his truck to pit road between stages for four fresh tires, a full tank of fuel and a wedge adjustment. Gragson fell back to the sixth spot on the restart and lost another position just before the field was slowed for the fifth time on lap 156. The talented teenager communicated to Fugle that he needed “more front turn and more rear security” if he was going to be able to compete for the victory. Fugle ordered up a four-tire and fuel stop complete with what he labeled a “major adjustment.” When the No. 18 Toyota returned to the track it was scored in the fourth position for the lap-162 restart. Gragson would lead the next several laps by about two-truck lengths and then with five laps remaining Sauter found speed in the middle groove and began to close in. As he looked to the outside of Gragson, Gragson moved up the track to block his attempt for the lead. Sauter settled in right on Gragson’s bumper as the race approached the final laps. Sauter got another strong run to the outside with two laps remaining. The two once again raced side-by-side down the backstretch and as they entered Turn 3, Gragson attempted to side draft Sauter to break his momentum. The two banged doors and Gragson’s Tundra turned towards the apron and then shot rear-end first hard into the outside wall. With Gragson’s day finished and the race going to overtime, the No. 18 Safelite team was relegated to a 20th-place finish. What happened that ended your race? Sauter collected his second NASCAR Camping World Truck Series victory of 2018 and the 19th of his career. Matt Crafton finished 0.533 seconds behind Sauter in the runner-up position. Justin Haley finished third, while David Gilliland and Harrison Burton rounded out the top-five finishers. The race featured seven cautions for a total of 46 laps. There were eight lead changes among four drivers. Gragson led three times for 60 laps. He has led at least one lap in four of the five events this season. Gragson moved up three positions in the NCWTS Driver Championship standings to third. After five races the 19-year-old driver is 58 tallies behind championship leader Johnny Sauter. He has earned three playoff points. Gragson will be back behind the wheel of the No. 18 Safelite AutoGlass Tundra when the Truck Series resumes action May 11 at Kansas Speedway in Kansas City. In. Live coverage of the NASCAR Camping World Truck Series 250 begins Friday at 8:30 p.m. ET on FS1.